Pain is a common experience during cancer treatment, but for some children and adolescents, the pain isn’t over when the cancer ends. This research seeks to better understand the pain experience in childhood cancer survivors. Having cancer can affect the way children experience different sensations like pain, the sense of touch and the sense of temperature. We are looking for childhood cancer survivors (8-17 years old) and their parent for a one-visit research study. The goal of this study to learn more about how children and teens experience different sensations after cancer treatment. 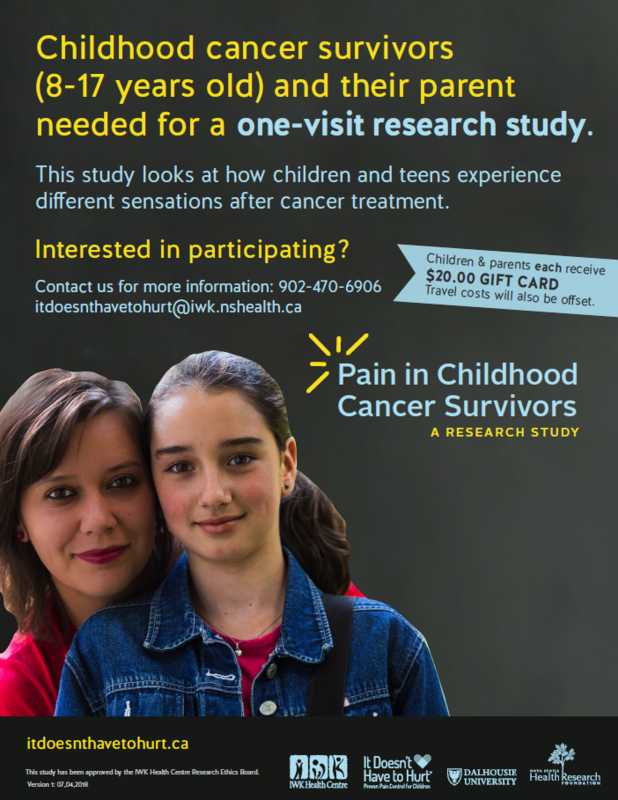 Recently, we completed another study with youth (ages 8-18 years old) living in Nova Scotia who have completed treatment for cancer and were interviewed about their experiences with pain. Thank you to all those who participated! These studies have been approved by the IWK Health Centre Research Ethics Board.